1x 4 Gb PCI-E Dual Port FC/AL card attached to an ST3510 FC Array. Eight application server instances were hosted in 8 separate Solaris Containers. The eighth container used the default processor set. connected to the 10 GbE switch. where 2 containers each shared 1 of 4 1GBit NICs for these subnets. using /usr/sbin/pbind -b processor_id pid. on the StorageTek 3510 and ST2540/2501 Arrays. This extrapolates to 86 GB storage for a 24 hour run. The database was configured with 8760 GB of storage. as 4 RAID 1 logical drives for the database files. as a single RAID 1 logical drive to store the database redo logs. RAID 1 logical drive for the application server JMS persistence logs. the Product Number is the region code and would be vary by region. with the database node acting as the DNS server. 7 application server instances in processor sets using DNS. all 8 application server instances using DNS. 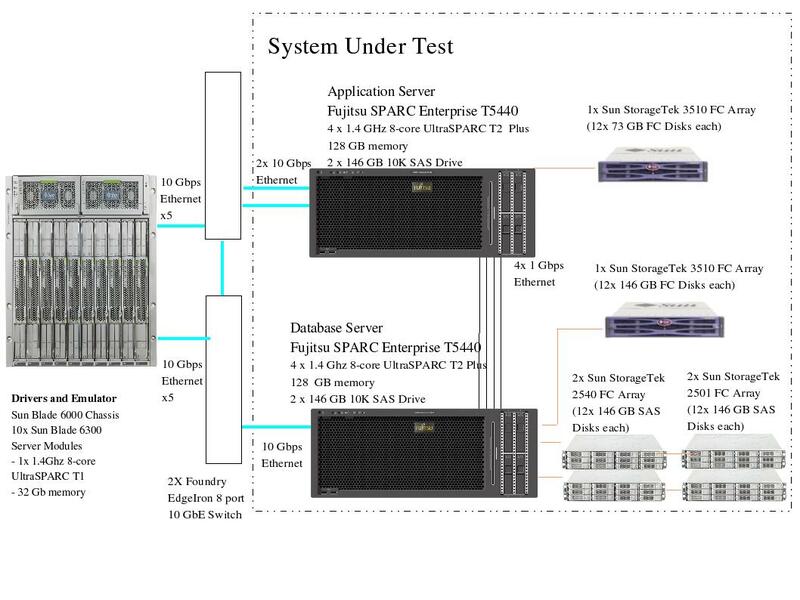 This result was measured on the Sun SPARC Enterprise T5440.